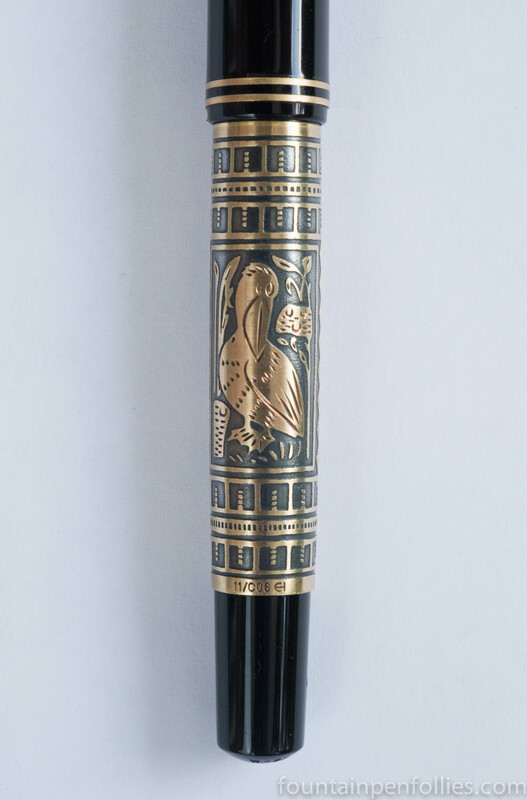 Pelikan M700 Toledo with extra-fine nib. 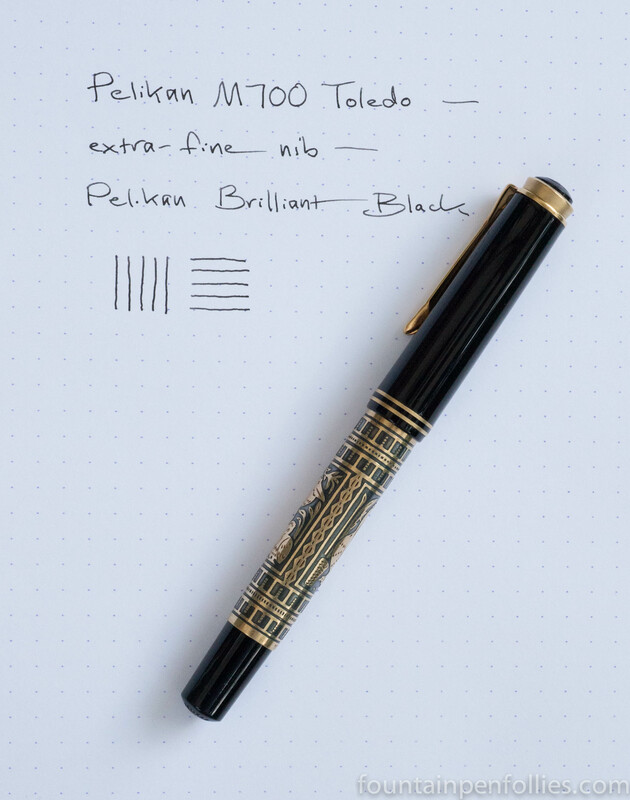 This is the smaller of Pelikan’s two modern Toledos. It is based on the M400 body. The sleeve is sterling silver, with the decorative parts engraved by hand. It is then treated to darken the base and cover with gold the part of the design that stand in relief. I bought the pen used and added the extra-fine nib later. Richard Binder ground the nib himself from a stock medium nib when he realized that he had run out of extra-fines. I know I got the better end of that deal; this is one great nib. The ink is Pelikan Brilliant Black. It’s not a dark black, but a more gray black, and it’s a dry ink, so it keeps the line nicely narrow. Next Post Lamy Safari Week – Day One: Do You Think It’s “Ugly”? You Probably Are a Grown-Up. I think you’ve hit on something with the Art Deco reference. The original Toledo T111 came out in the early 1930s, so absolutely within that time period. This strikes me as a bit art deco, like in the twenties where they were really inspired by the tomb of King Tut and they were all about the egyptian-y stuff. 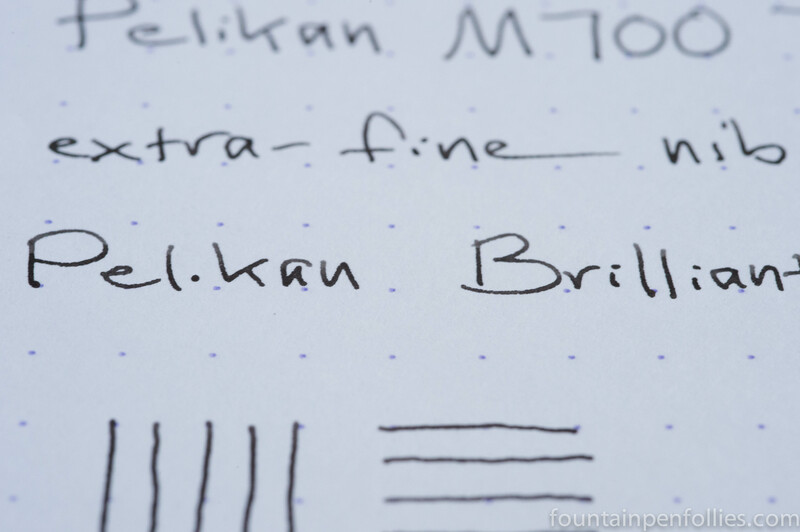 Really cool, very different Pelikan! The skinny nib looks gorgeous, and they’re not even my favorite normally!